I used to read techcrunch everyday. It was my first destination to lean and discover the startup world. I saw the evolution from almost day 1 up to now. Unfortunately AOL bought Techcrunch. At first I was hopeful and maybe naïve that nothing is going to change. Today December 16 2011 the last most important Techcrunch employee left the building Heater Harde. After Mike Arrington then MG Siegler, Sarah lacy and even Paul Carr, the whole super star team is gone. Right now I’m more on hacker news techmeme and reddit …. I also discover flipboad in the meantime. It was a wonderful ride and beautiful website builds by Mike Arrington. Today Techcrunch has no soul. It was difficult to keep the website alive due to many Hackers attack. It affects my traffic and my community. I’m ready to work twice harder to make sure you get the best content possible. I have a ton of subject to share with you. I have to update my status about Groupon, Etsy and other popular services to get the best out of them. I’m still here to make sure BlackySky is going to survive forever. 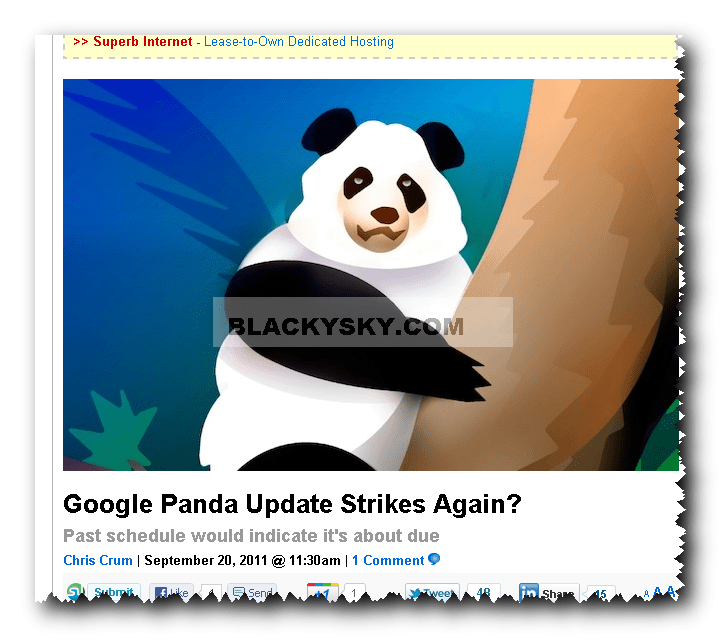 I’ve read almost everything about the Google panda update. The main problem about those updates is the definition of quality. From what I understand from Google, quality is a piece of content that people share, like (or +) or people link to it. Quality is more than that; it’s also the user experience. By user experience I mean is it easy to use or to get the information. The ultimate signals that Google panda update check are your traffic growth, bounce rate and your percentage of new visitors versus returning visitors. In other word, are you an authority? If you are the hottest website about cars Google will never slap you. SEO just get simpler, focus on one thing and one thing only, become the superstar and watch your traffic grow. SEO Optimization is boring now since rules change every time. I highly recommend that you read that article from quicksprout. Make sure you are the best at what you do and promote and share your great content everywhere. You do not need a SEO firm , you just need to promote like a king with outstanding information. Last month my goal was to speed up my website. Therefore I decide to use CDN (the best technology to run your website super fast). I was going to sign up to Rackspace but I discover this free service CloudFlare. Then I was on vacation, when I come back my traffic was down and my wordpress was buggy. Cloudflare was the last plugin I add. To be fair the service speed up my website but it was not a huge difference. The trouble wasn’t worth it. I decide to uninstall it and my website was back online smoothly. I had a rough time lately with my website. I will come back with more content. It is clear that I need to blog more. I have so many experiences and case studies to share with you. Free means free and usually it’s not great unless your name is google …. I read everywhere that you need a killer subject title to increase your open rates. I discovered that it is far from true. Yes, a good subject title may help your open rates but there is something 10 times more important then that. I discovered that it is more important the reason they get on your e-mail list in the first place. Let say I ask you to be on my e-mail list to download a music song. At this point you expect only one e-mail from me: the one with the music song. Therefore any other e-mails may miss the target because you are not expecting that e-mail. You will put this e-mail in the ad “category” because it is not expected. At this point a killer subject headline may help but it will not impact your open rates that much. Now let say I ask you to sign up to an e-mail list and every week or every month I will send you a great interview. Your open rate is going to be 10 times better because they expect a great interview from you. I design an open rate formula. I use this formula for my marketing strategy and I decide to share it with you. example: the idea is to show your talent , your skills and expertise. Thank you e-mail: tell them what they can expect and the schedule. Give them a bonus right away. the idea behind the bonus is to make sure they remember you. People love extra gift. Finally focus and respect this schedule as much as possible. This is my personal plan. I was inspired by Kevin Rose and his foundation e-mail list. He has no killer subject lines or the cutest e-mail design but he has great content. I know his open rates are high. I hope I help someone. I will definitely publish my result in the near future. Therefore I invite you to join my e-mail list today.